The North Atlantic right whale got its name from whalers. Because these whales travel slowly and spend a lot of time at the surface, they were easy targets. For whalers they were the “right” whales to hunt. 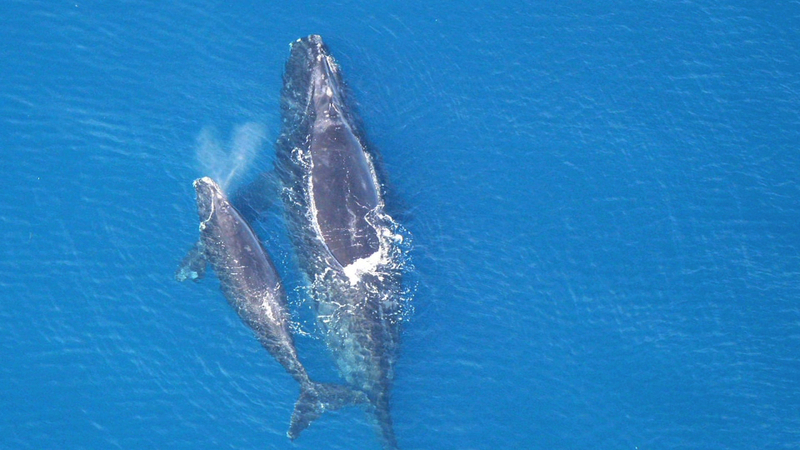 With fewer than 400 left, they are now the “right” whales to save. Marine biologists track their migratory routes off North America for the spring and fall, but the wintering grounds for much of the right whale population are unknown. Using hydrophones, scientists recorded whale calls in the waters between Greenland and Iceland from July to December of 2007. A hydrophone is simply a microphone designed to capture underwater sounds. North Atlantic right whale calls sound like screams, bangs, and groans. After deciphering thousands of these new recordings, there was evidence of right whales calling nearby many times. This area was thought to be an abandoned habitat, but this discovery confirms that it continues to be used. New discoveries always lead to more questions: How many whales are there? Could these whales be members of a totally separate population, or even an eastern population thought to be extinct? Whatever the answers may be, hydrophones helped us find these whales in a hard to reach location. But most important, if we know where these right whales are wintering, then we can better protect them and maybe even help them recover. La Ballena Franca del Atlántico Norte debe su nombre a los balleneros. Debido a que estas ballenas viajan lentamente y pasan mucho tiempo en la superficie, eran un blanco fácil. Para los balleneros eran las ballenas "correctas" para cazar. Con menos de 400 ejemplares, son ahora las ballenas "correctas" para salvar. Los biólogos marinos dan seguimiento a sus rutas migratorias fuera de América del Norte durante la primavera y el otoño, pero las zonas de invierno para gran parte de la población de las ballenas francas son desconocidas. Mediante el uso de hidrófonos, los científicos registraron cantos de ballenas en las aguas entre Groenlandia e Islandia de julio a diciembre de 2007. Un hidrófono es simplemente un micrófono diseñado para capturar sonidos bajo el agua. Los cantos de la ballena franca del Atlántico Norte suenan como gritos, golpes y gemidos. Después de descifrar miles de estas nuevas grabaciones, había evidencia de cantos de ballenas francas en los alrededores en repetidas ocasiones. Esta zona se pensaba que era un hábitat abandonado, pero este descubrimiento confirma que sigue siendo utilizada. Nuevos descubrimientos siempre conducen a más preguntas: ¿Cuántas ballenas hay? ¿Podrían estas ballenas ser miembros de una población totalmente diferente?, o incluso ¿una población del Este que se creía extinta? Cualesquiera que sean las respuestas, los hidrófonos ayudaron a encontrar a las ballenas en un lugar de difícil acceso. Pero lo más importante, si sabemos dónde estas ballenas francas pasan el invierno, mejor podemos protegerlas e incluso ayudarles a recuperarse. North Atlantic Right Whales weigh up to 20 tons and average 50 ft in length. Right whales are the rarest of all large whale species and among the rarest of all marine mammal species. North Atlantic Right Whales are a federally protected species and law requires that boats stay at least 500 yards away from the whales.